"A family of whales trapped beneath the ice. One unforgettable rescue." 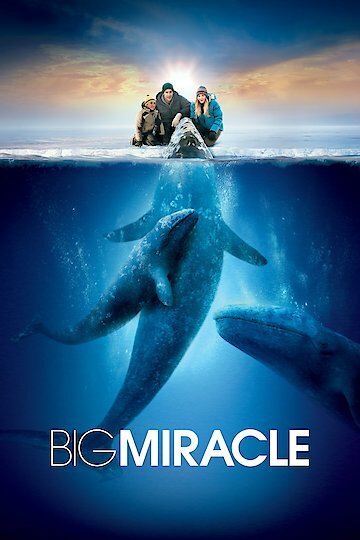 Big Miracle, released in 2012 by Universal Pictures, was directed by Ken Kwapis. It starred Drew Barrymore, John Krasinski, and John Pingayak. Based on a true story, Big Miracle is the story of an Alaskan reporter, Adam Carlson (John Krasinski), who yearns to move on from his northern Alaska market in search of bigger stories. Before he knows it, however, he is knee-deep in what may well be the story that defines his career. He discovers a trio of majestic gray whales trapped beneath the ice in the Arctic Circle. His story not only catches the nation's attention, but also that of his ex-girlfriend and Greenpeace worker, Rachel Kramer (Drew Barrymore). Once Rachel hears Adam's story, she boards a plane to Alaska and begins rallying everyone from Inupiat locals to politicians in hopes of saving the otherwise hopeless trio of whales. Their collaboration, however, does not come without selfishness. While the Inupiat whalers agree to help this trio, they remain hunters nevertheless. An oil tycoon seizes the moment to appear environmentally friendly. A presidential aide seeks to gain precious moments of political popularity that are sure to be remembered when elections come back around. While this unlikely group of collaborators agree to work together to serve a common purpose in saving the whales from an icy death, they are also reaping rewards of their own. In another shocking turn of events, the quest to free the whales eventually leads to uniting Russian and American military briefly during the Cold War. This kind of cooperation and peace in a time of bloodshed is typically unheard of, especially during a war, and is historic proof the world can unite around a common purpose to produce miracles that stand the test of time. Big Miracle is currently available to watch and stream, download, buy on demand at Netflix, Amazon, Vudu, Google Play, FandangoNow, iTunes, YouTube VOD online.